Kohl’s stands apart from peers such as Macy’s and JCPenney in that it has not closed any stores. But its announcement that it is seeking to rightsize selected stores is another indication that department store retailers are increasingly recognizing that they are overspaced. Kohl’s is a predominantly off-mall department store retailer and its locations in open-air centers are fundamentally square boxes. The company’s core estate of larger stores (which are the kind we expect to see downsized) average 88,000 gross square feet. Aldi’s stores are smaller square boxes. According to two recent Aldi US real estate brochures, the company looks for stores that are 17,000–22,000 gross square feet in size. If we split the difference and assume that Aldi will take an average of 20,000 square feet of space from each of the Kohl’s stores involved in the pilot program, then the implication is that Aldi will take approximately 23% of space from each of the downsized Kohl’s stores. Aldi aims to operate 2,500 US stores by the end of 2022, up from a current 1,755 (per Aldi’s online store locator). We believe that Aldi opened approximately 150 US stores in 2017, and we estimate that it will open 200 more in 2018. The expansion of retailers such as Aldi, Lidl, dollar stores and off-price chains is underpinning strong demand at open-air shopping centers, which we noted in our January 2018 report What Retail Apocalypse? Reviewing Trends in US Brick-and-Mortar Retail. 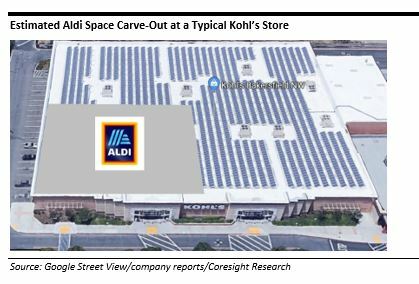 By carving out space for Aldi stores, Kohl’s is giving Aldi access to such open-air centers, including those where high occupancy levels mean that there are no existing retail units available for Aldi to move into. Kohl’s operates 1,158 stores in 49 US states, providing a potentially wide network of locations for Aldi to tap—although, of course, availability depends on which stores Kohl’s is willing to downsize. This looks to be a win-win for Kohl’s and Aldi. For Kohl’s, it provides a complementary, traffic-driving tenant ready to take space as it downsizes a swathe of stores. For Aldi, it provides more potential locations in a real estate market that sees high occupancy rates at in-demand open-air centers. Lastly, this move is the latest manifestation of fresh thinking from Kohl’s. Late last year, some Kohl’s stores began selling Amazon technology devices, such as the Echo, and accepting returns on behalf of Amazon. In a still-faltering department store sector, the company’s creative approaches to product, services and real estate are to be welcomed. 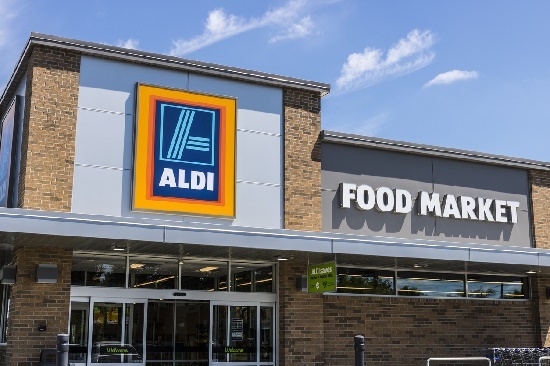 Other pieces you may find interesting include: Kohl’s and Aldi: A Win-Win for an Overspaced Department Store and a High-Growth Grocery, Discounters Go Digital: How Can Aldi and Lidl Tackle Grocery E-Commerce?